I’m a Lego guy. As I wrote about in my review of The Lego Movie, I spent countless hours playing with Legos as I was growing up. Building, destroying, re-building, I’m not ashamed to admit that if I come across a kit nowadays that I like, I have no reservations about buying it and putting it on display. It’s little surprise, then that when The Lego Movie came out in 2014, I absolutely adored it. Going beyond the silliness and humor, I loved the fact that it captured the spirit of the toy, in that you could either build a pristine set from instructions or cannibalize sets for parts and build something truly unique. 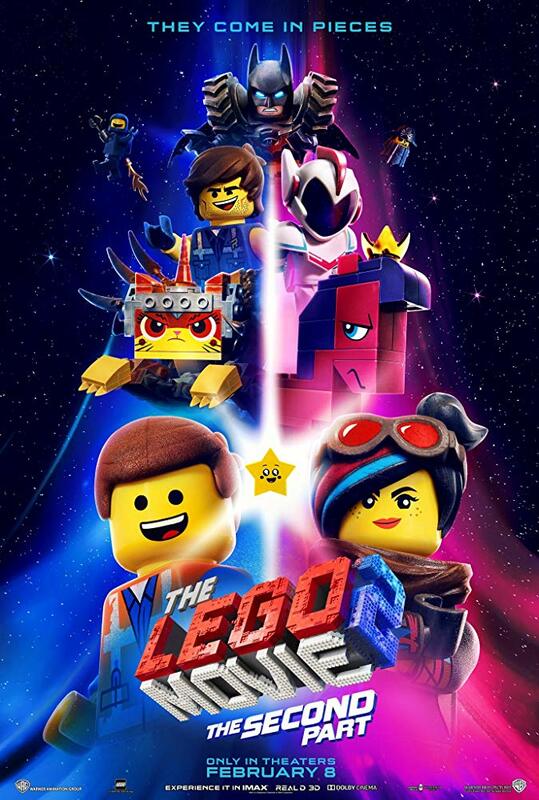 Given how well it did, it was inevitable that other Lego movies would be released, first The Lego Batman Movie and The Lego Ninjago Movie in 2017, but we haven’t had a proper sequel until now. Thankfully, The Lego Movie 2: The Second Part manages to almost pick up right where it left off, not only in plot, but in returning cast and crew. Set five years after the events of the first film, the city of Bricksburg’s been reduced to a post-apocalyptic wasteland, appropriately called Apocalypseburg. Repeatedly attacked and scavenged by an invading alien force (the little sister of Finn, the human protagonist of the first film), it’s reminiscent of the Mad Max universe. Ever-optimistic Emmet (Chris Pratt) is still doing what he does best, maintaining a cheery disposition while doting affection on Wyldstyle (Elizabeth Banks), going so far as to build a house for the two of them, complete with double-decker porch swing. 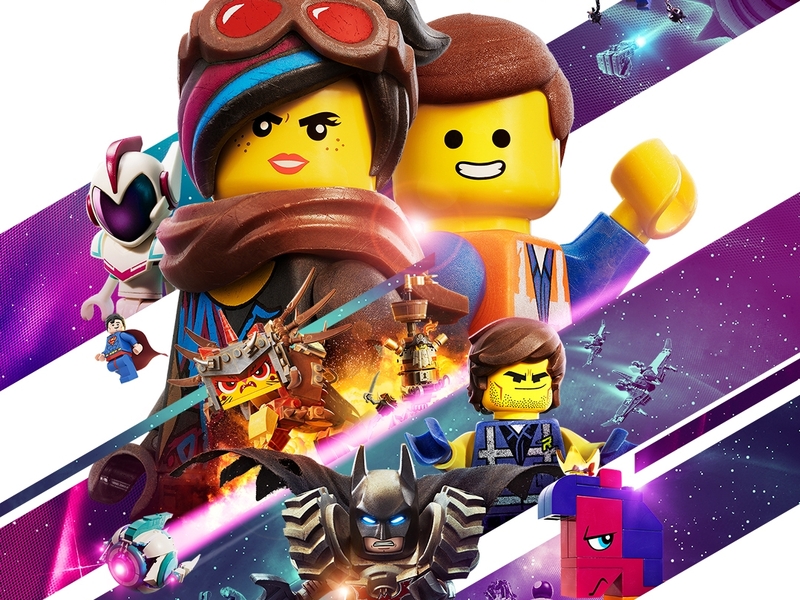 Unfortunately, his hopes for a happy life are dashed when one final assault by General Sweet Mayhem (Stephanie Beatriz) results in the capture of Wyldstyle, Benny (Charlie Day), Batman (Will Arnett), and Princess Unikitty (Alison Brie), forcing Emmet to build his own spaceship and pursue them. Perhaps the biggest strength of the film is that it settles in quickly and easily returns you to the imagination of the first movie. With Phil Lord and Christopher Miller returning as producers and writers (they wrote and directed the first), the continuity is nearly flawlessly executed. Director Mike Mitchell did a wonderful job in getting us back to Bricksburg while adding his own little touches (the sense of self-awareness the movie has is hilarious at times). The voice cast does a fantastic job (Tiffany Haddish does well as the primary antagonist), and the animation’s absolutely top-notch. It isn’t perfect, though. At times, the humor and music almost feel a little too forced. There are a few more musical numbers in the sequel than the original, and I wasn’t as on board with the idea of incorporating singing into the film, but that could be a matter of personal preference. It’s hard to pinpoint exactly, but while they do a great job of pulling us back into the Lego universe, they just come up a little short at capturing the emotional pull the first one did. We ultimately find out the conflict behind the abductions is the struggle between Finn and his little sister, a struggle that siblings will know all too well, and while they certainly have some touching moments, I just couldn’t feel as emotionally invested as I did at the end of the first. That’s not to say that I didn’t enjoy the experience. Between the visuals and the performances by the cast, it’s tough not to enjoy the time in Bricksburg and the Systar system. There are plenty of cameos to keep people entertained, and most importantly, the kids in the theater at the screening seemed to thoroughly enjoy it as much as the adults. Skeptics may dismiss the film as one big Lego advertisement, but even if that’s the case, I still think it’s a worthy effort.